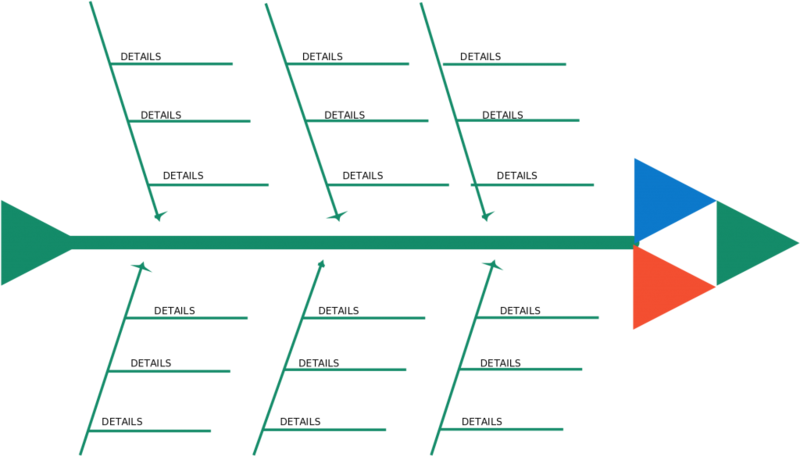 Fishbone (aka Cause and effect/Ishikawa) diagrams are great for analyzing processes and identifying defects in them. They are a great way to visualize causes and their effects. Fishbone diagrams are used in many industries but primarily they’re used in manufacturing, sales, and marketing. 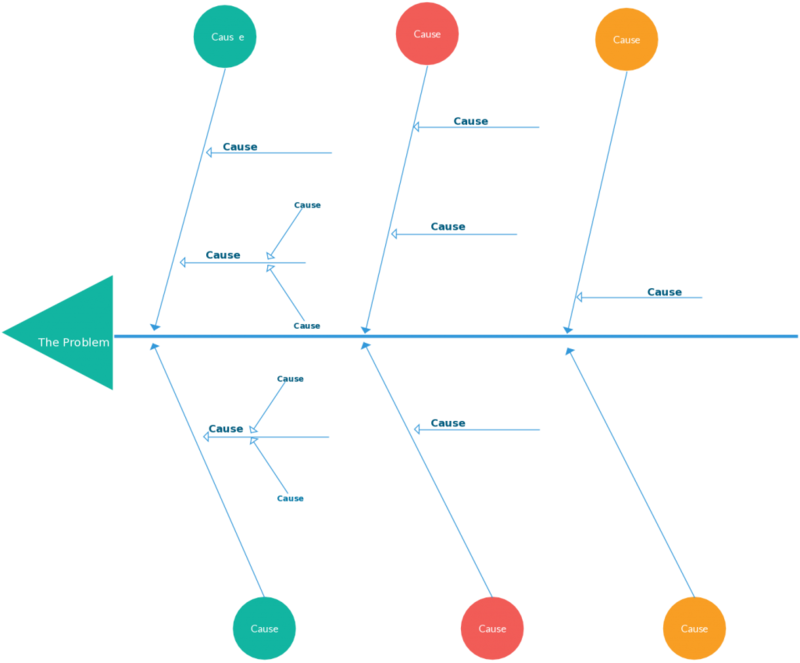 Below are some fishbone diagram templates from our diagramming community. You can download them or modify them online using our diagramming tool. Just click on the images and we’ll open the templates as a diagram. A fishbone diagram template that can be used in the manufacturing process. The 6 Ms of manufacturing are already added to the branches. Not all of the branches might be relevant to your organization, so delete the unnecessary branches when editing the diagram. Click on the image to edit the diagram. 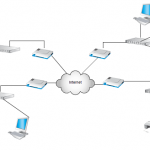 Another advantage of using our diagramming tool is real-time collaboration. You can invite others to edit the diagram and together work on the diagram. 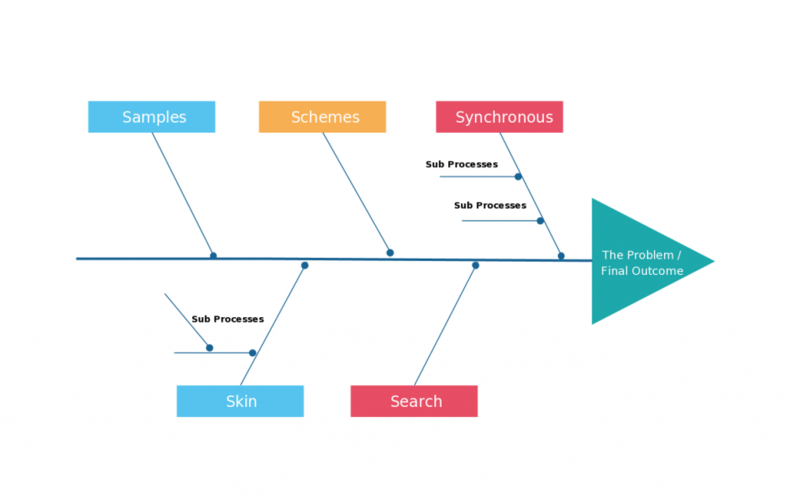 In most cases you need to work on the Fishbone diagram as a team, because there are many parties involved in a process. And they might be in distributed locations as well. Our real-time collaboration tools make it easier for you to work as a team. 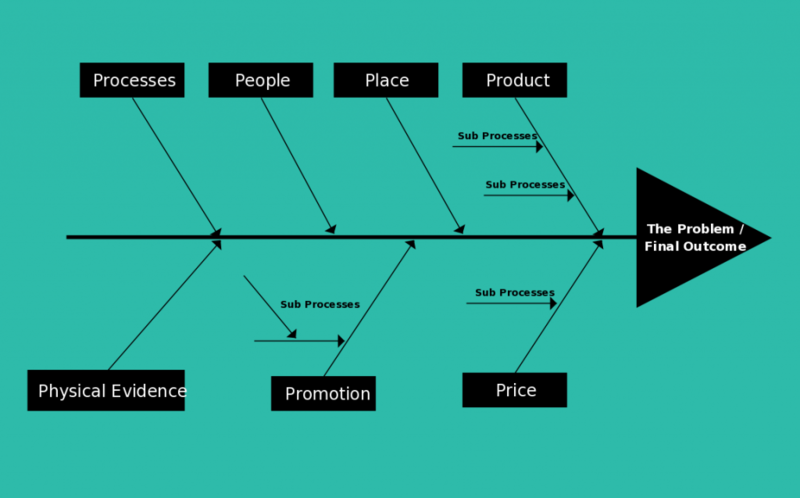 An Ishikawa diagram template that can be used in the sales process. Similar to the previous one, the 5 Ss of sales are already added to the branches. Click on the image to open it in our drawing tool and modify to fit your requirements. 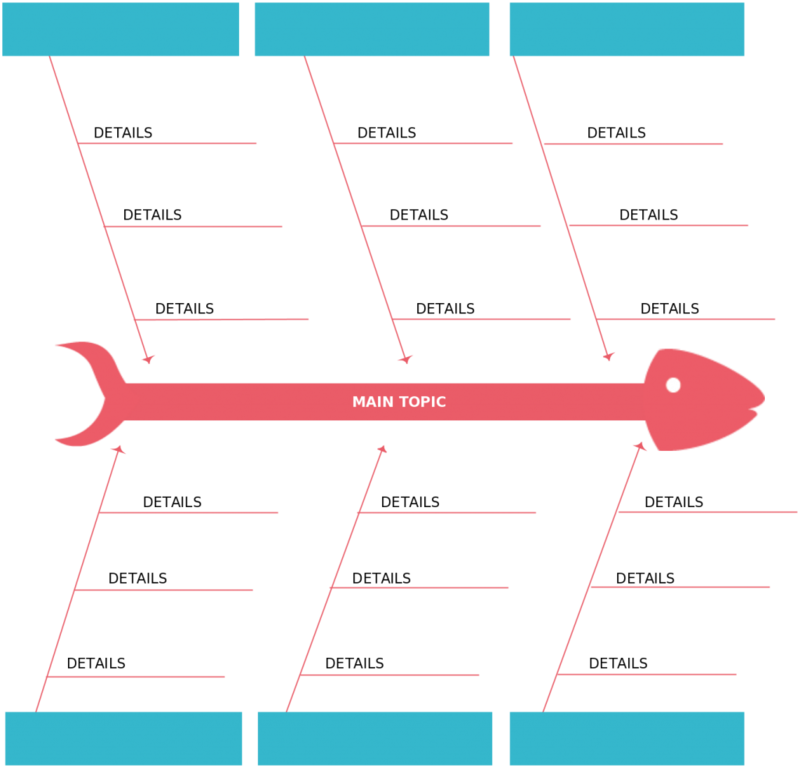 A fishbone diagram template that can be used in a marketing plan. The 7 Ps of marketing are already added to the branches. Create your own Marketing plan by clicking on the image below. 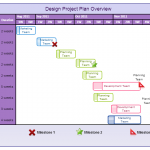 Manufacturing, Sales and marketing are not the only areas that fishbone diagram templates can be used. This below template is a general one which can be used across any industry. Like the others, you can easily modify this one to fit your requirements. 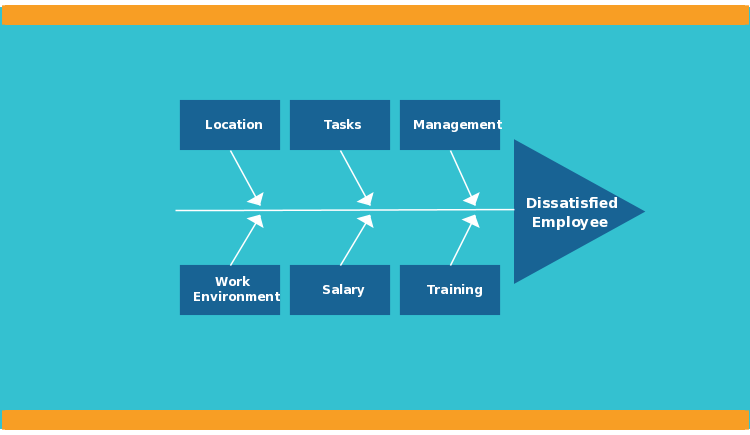 A fishbone diagram template showing the causes and effects of employee dissatisfaction. This one highlights another important feature of Creately, namely the color palette. Although black and white diagrams are easier for printing and gives a professional look, some colors can add clarity and visual appeal to a diagram. 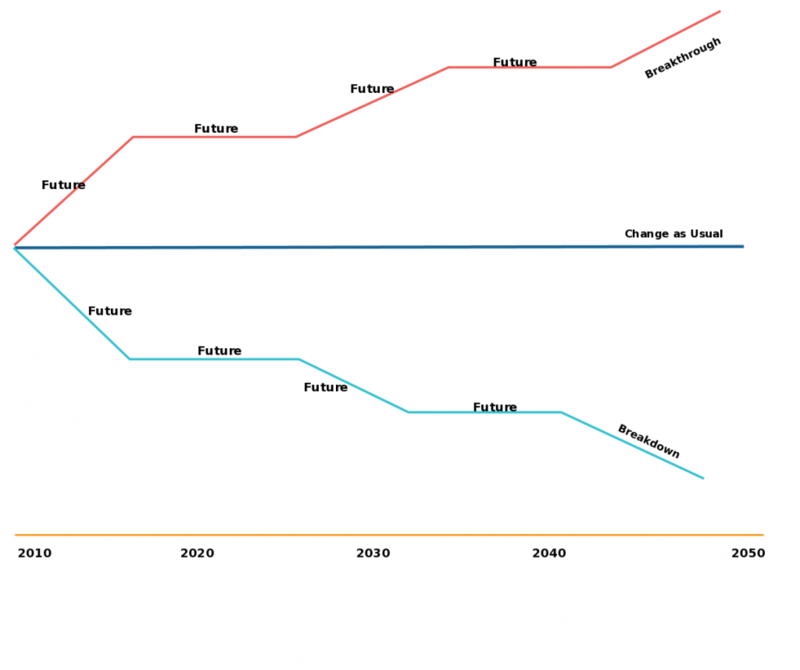 Consider this when creating your own fishbone diagram. 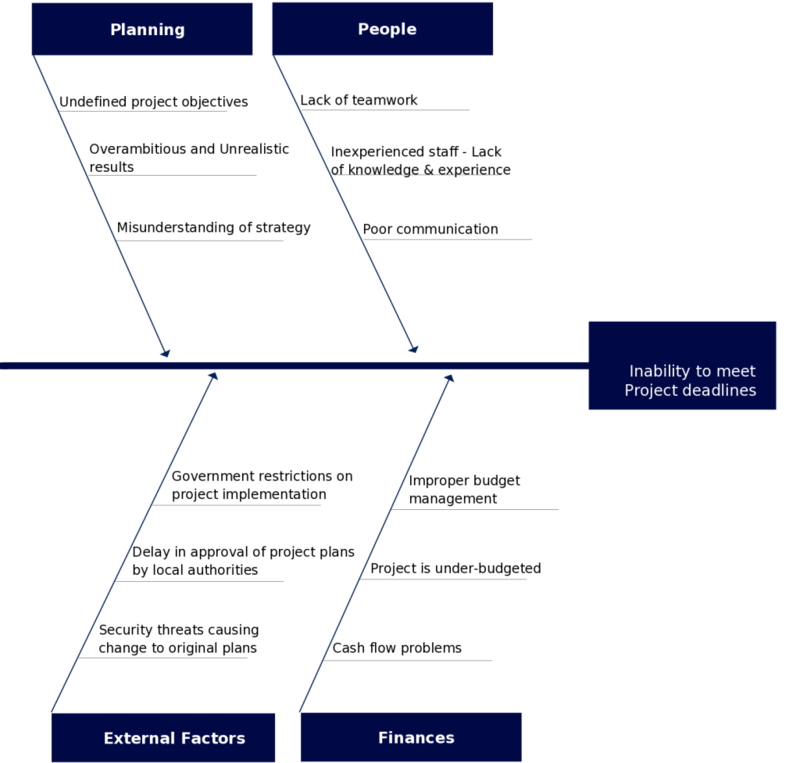 This cause and effect diagram below shows reasons that may cause a delay in meeting deadlines of a project. Incorporating a fishbone diagram like this when you are planning your project will help you better focus both your resources as well as the efforts of your team, and hence eliminate the causes that might delay the completion of the project. Usually, fishbone diagrams are used to figure out the reasons why something went wrong. Once you work out what is causing the issues, you and your team can come up with solutions to overcome it and prevent it from happening again. And the good thing about cause and effect diagram is that, you can also use it the other way around; figure out the outcome you want to achieve and find the best (issue-free) ways to get there. 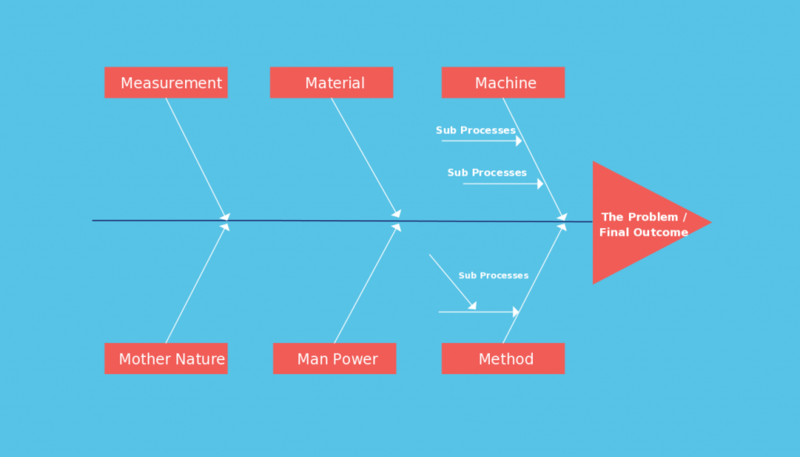 Here is a presentation-ready Ishikawa diagram. If your presentation is about deconstructing an issue, or finding solutions for one or trying to introduce to your team a certain outcome and the easiest ways to achieve it, you can use this diagram. Click on the image to edit it online and add the details you want. Here is another simple fishbone diagram template. You can click on the image to modify it online and fill it with the relevant details. Using Creately editor, you can also change the color theme. When working on a team project, you constantly encounter issues, or you constantly have to find ways to avoid issues that may arise. Brainstorming is the best technique to find solutions for your issues and strategies to reach your goals. And using a fishbone diagram while you brainstorm will help you do things right. It can also be incorporated in the analyzing phase of a six sigma analysis, where root causes are identified as the first step of eliminating defects in a process. These are some of the industry specific fishbone diagram templates available to our users. But there are plenty more in our diagramming community. So go ahead and check out more fishbone diagram examples. 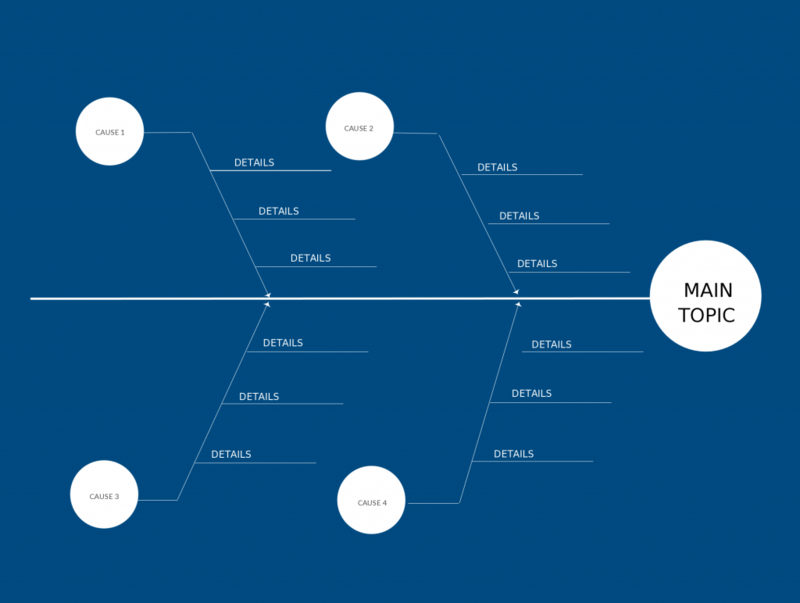 Want to learn more about how to effectively use fishbone diagrams? Check out this fishbone diagram tutorial. Looking at these diagrams, it’s easy to see how they get their name. I can see where using a technique like this while brainstorming would be effective. I have not heard of this technique till I stumbled upon this post.